On June 4th, 2017, we wrapped up the pilot year of the Sacred Solidarity Network, a 10-month collaborative project of the MARCH (Multi-faith Anti-Racism Change and Healing) table. 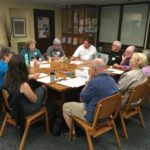 The Sacred Solidarity Network coordinating group consisted of the Kaleo Center, Center for Sustainable Justice, OutFront MN, and MUUSJA (MN Unitarian Universalist Social Justice Alliance). 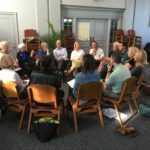 Through the Sacred Solidarity Network, we worked with 12 congregations over a 10-month period to deepen and expand their racial justice work both inside and beyond their congregations. Learn more about the structure and ideas behind the program here: Sacred Solidarity Network Overview. Here are a few photos from our launch retreat back in September! Kaleo’s work with Sacred Solidarity and MARCH is an expression of our commitment to praxis –the cycle of action, reflection, refinement, and further action – which guides all of our work. In particular, it’s important for Kaleo that we be actively engaged with the field of social transformation in ways that that directly inform our academic programs. 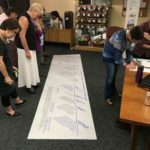 During this pilot year, the Sacred Solidarity Network made extensive use of Kaleo’s Social Transformation Matrix, a tool that Kaleo developed as a strategic and analytical framework for understanding and planning social transformation efforts. Through this engagement, our understanding of how the matrix works as a descriptive, analytic, and strategic tool has been immeasurably deepened. 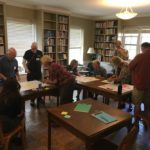 As we end our pilot year, we’re taking what we learned and revising our plans for a second year of the Network, with some congregations choosing to continue participating for a second year, while others depart and new congregations join. 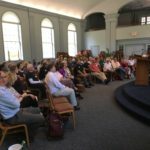 We anticipate working with 12-15 congregations in the coming year, and will share a list of 2017-2018 cohort congregations early in the fall. Racial justice is a core commitment of the Kaleo Center, and we’re grateful for the opportunity to support the Sacred Solidarity Network.